Often, it is not helpful or informative to only look at all the variables in a dataset for correlations or covariances. A preferable approach is to derive new variables from the original variables that preserve most of the information given by their variances. Principal component analysis is a widely used and popular statistical method for reducing data with many dimensions (variables) by projecting the data with fewer dimensions using linear combinations of the variables, known as principal components. The new projected variables (principal components) are uncorrelated with each other and are ordered so that the first few components retain most of the variation present in the original variables. Thus, PCA is also useful in situations where the independent variables are correlated with each other and can be employed in exploratory data analysis or for making predictive models. Principal component analysis can also reveal important features of the data such as outliers and departures from a multinormal distribution. Principal component analysis continues to find a linear function \(a_2'y\) that is uncorrelated with \(a_1'y\) with maximized variance and so on up to \(k\) principal components. The principal components of a dataset are obtained from the sample covariance matrix \(S\) or the correlation matrix \(R\). Although principal components obtained from \(S\) is the original method of principal component analysis, components from \(R\) may be more interpretable if the original variables have different units or wide variances (Rencher 2002, pp. 393). For now, \(S\) will be referred to as \(\Sigma\) (denotes a known covariance matrix) which will be used in the derivation. Which shows \(\lambda\) is an eigenvector of the covariance matrix \(\Sigma\) and \(a_1\) is the corresponding eigenvector. As stated previously, we are interested in finding \(a_1'y\) with maximum variance. Therefore \(\lambda\) must be as large as possible which follows \(a_1\) is the eigenvector corresponding to the largest eigenvalue of \(\Sigma\). The remaining principal components are found in a similar manner and correspond to the \(k\)th principal component. Thus the second principal component is \(a_2'y\) and is equivalent to the eigenvector of the second largest eigenvalue of \(\Sigma\), and so on. Principal component analysis will be performed on the data to transform the attributes into new variables that will hopefully be more open to interpretation and allow us to find any irregularities in the data such as outliers. Load the data and name the columns. The factors in the Group column are renamed to their actual grouping names. Inspect the first few rows of the data. The variables appear to be measured in different units which may lead to the variables with larger variances dominating the principal components of the covariance matrix \(S\). We will perform principal component analysis on the correlation matrix \(R\) later in the example to find a scaled and more balanced representation of the components. Find the covariance matrix \(S\) of the data. The grouping column is not included. Which is also equal to the sum of the eigenvalues of \(S\). Compute the eigenvalues and corresponding eigenvectors of \(S\). The eigenvectors represent the principal components of \(S\). The eigenvalues of \(S\) are used to find the proportion of the total variance explained by the components. The first two principal components account for 75.5% of the total variance. 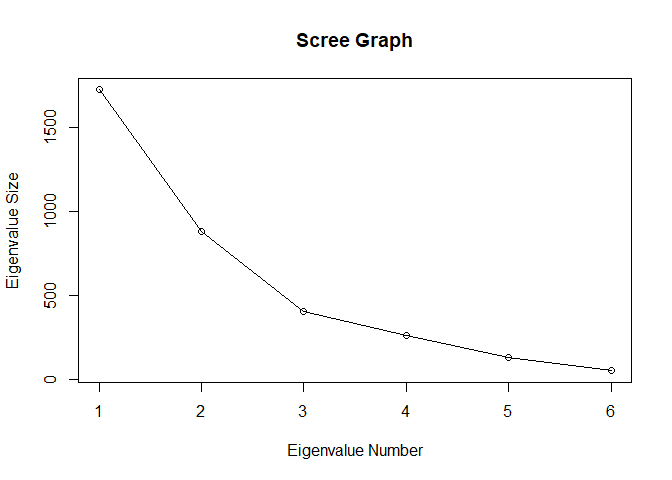 A scree graph of the eigenvalues can be plotted to visualize the proportion of variance explained by each subsequential eigenvalue. The elements of the eigenvectors of \(S\) are the 'coefficients' or 'loadings' of the principal components. The calculation is done by a singular value decomposition of the (centered and possibly scaled) data matrix, not by using eigen on the covariance matrix. This is generally the preferred method for numerical accuracy. The calculation is done using eigen on the correlation or covariance matrix, as determined by cor. This is done for compatibility with the S-PLUS result. Although we didn't use the preferred method of applying singular value decomposition, the components reported by the prcomp() are the same as what was computed earlier save arbitrary scalings of \(-1\) to some of the eigenvectors. The summary method of prcomp() also outputs the proportion of variance explained by the components. The first two principal components are often plotted as a scatterplot which may reveal interesting features of the data, such as departures from normality, outliers or non-linearity. The first two principal components are evaluated for each observation vector and plotted. The ggfortify package provides a handy method for plotting the first two principal components with autoplot(). The autoplot() function also generates a useful data table of the calculated principal components we which we will use later. The points of the two groups are clustered for the most part; however, the three points at the top of the graph may be outliers. The data does not appear to depart widely from multivariate normality. We will see if this conclusion changes when the PCs from the correlation matrix \(R\) are plotted. To recreate the graph generated by autoplot(), scale the data using the standard deviations of the principal components multiplied by the square root of the number of observations. The principal components are then computed for each observation vector. Note the first eigenvector is multiplied by a scaling factor of \(-1\) so the signs what was reported by the prcomp() function. 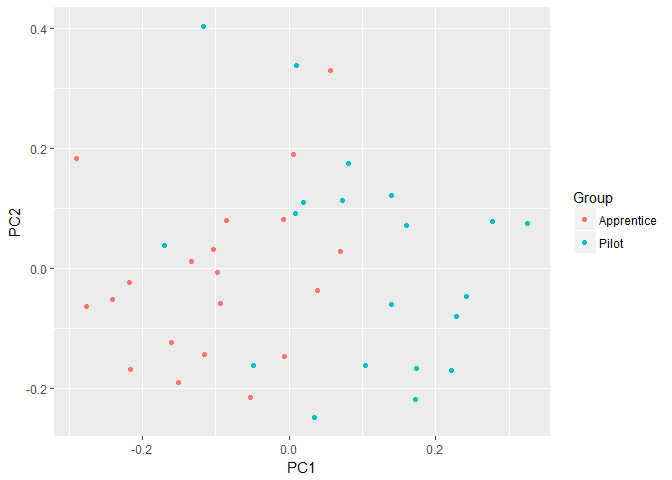 Collect the PCs in a data.frame and plot using ggplot (loaded when ggfortify was loaded). The scaling employed when calculating the PCs can be omitted. To remove scaling in the autplot() function, set the scaling argument to 0. As mentioned previously, although principal component analysis is typically performed on the covariance matrix \(S\), it often makes more intuitive sense to apply PCA to the correlation matrix. Cases where using \(R\) may be preferable to \(S\) include data that is measured in different units or has wide variances. The pilot data analyzed does not appear to have commensurate units for each variable, and because we have very little information regarding the tests and the measurements collected, it might make sense to employ the \(R\) matrix rather than \(S\). The correlation matrix is found with the cor() function. Find the eigenvalues and eigenvectors of the \(R\) matrix. As with the covariance matrix, we can compute the proportion of total variance explained by the eigenvalues. What is readily noticeable is the first eigenvalue accounts for 30% of total variance compared with 50% of the variance of the \(S\) matrix. The first two components of \(R\) only account for 52% of total variance while the last two components have little significance. Thus, one may want to keep the first four components rather than the first two or three with the \(S\) matrix. To perform principal component analysis using the correlation matrix using the prcomp() function, set the scale argument to TRUE. Plot the first two PCs of the correlation matrix using the autoplot() function. The points remain clustered for the most part; however, there does appear to be more points outside that may be considered outliers, though they don't appear to be too far off from the cluster. It is important to remember the first two PCs of the \(R\) matrix only represent 52% of the total variance and thus may not be fully representative of the variance in the dataset. Interpretation of principal components is still a heavily researched topic in statistics, and although the components may be readily interpreted in most settings, this is not always the case (Joliffe, 2002). One method of interpretation of the principal components is to calculate the correlation between the original data and the component. The autoplot() function also generates a nice data table with the original variables and the calculated PCs, which we will use here to find the correlations. First, compute the correlations between the data and the calculated components of the covariance matrix \(S\). The PCs can then be interpreted based on which variables they are most correlated in either a positive or negative direction. The level at which the correlations are significant is left to the researcher. The first component is positively correlated with Dotting, Perservation, Intelligence and Dynamometer. This correlation suggests the five variables vary together and when one goes down, the others decrease as well. The component is most correlated with Dotting at \(.087\) and could be considered as primarily a measure of Dotting. The second component is most correlated with Perservation and Intelligence, both in a negative direction. Dotting is correlated with the second component in a positive direction, which would indicate that as Perservation and Intelligence decrease, Dotting increases. The third component is primarily correlated with Intelligence and not much else. This component could be viewed as a measure of the intelligence of the individual apprentice or pilot. It was decided previously that due to lack of information regarding the variables and their units of measurement, it makes more sense to use the correlation matrix \(R\) for performing principal component analysis. Let's see how the interpretation of the principal components changes when we use the \(R\) matrix. The most apparent changes between the correlations of the original variables and the PCs of the \(S\) and \(R\) matrices are in components 2 and 3. The first principal component is still strongly correlated with the variables Dotting and Perservation, but now the variables Intelligence and Dynamometer are much more correlated and could indicate that as the former two variables decrease, the latter two increase. The second component is now correlated the most with Forming Relations and not much else, whereas with the \(S\) matrix the component was correlated more to Perservation and Intelligence. This difference in variable correlations between the components of the two matrices may indicate Perservation and Intelligence were unduly dominating the variances. The third component is now most correlated with Sensory Motor Coordination and secondarily Intelligence and Perservation, which indicates that subjects with high Sensory Motor Coordination test scores also have higher Intelligence and Perservation scores. 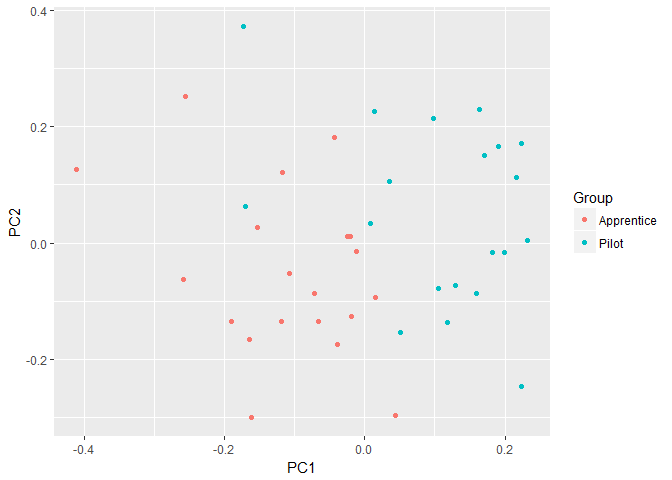 This post ended up being much longer than I had anticipated but I hope it is a good introduction to the power and benefits of principal component analysis. The post covered PCA with the covariance and correlation matrices as well as plotting and interpreting the principal components. I plan to continue discussing PCA in the future as there are many more topics and applications related to the dimension reduction technique. Joliffe, I. T. (2002). Principal Component Analysis (2nd ed.). Springer.